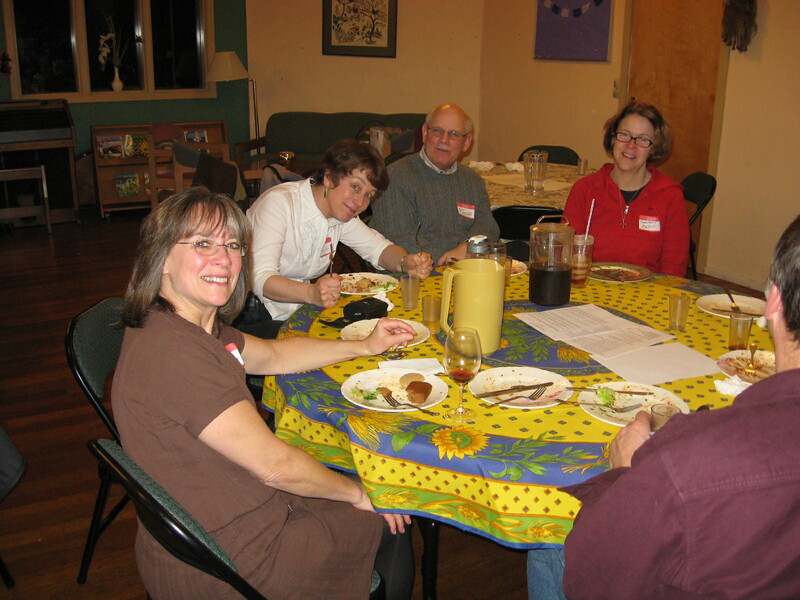 Slow Food Corvallis held its annual meeting at the Unitarian Universalist Fellowship Social Hall. 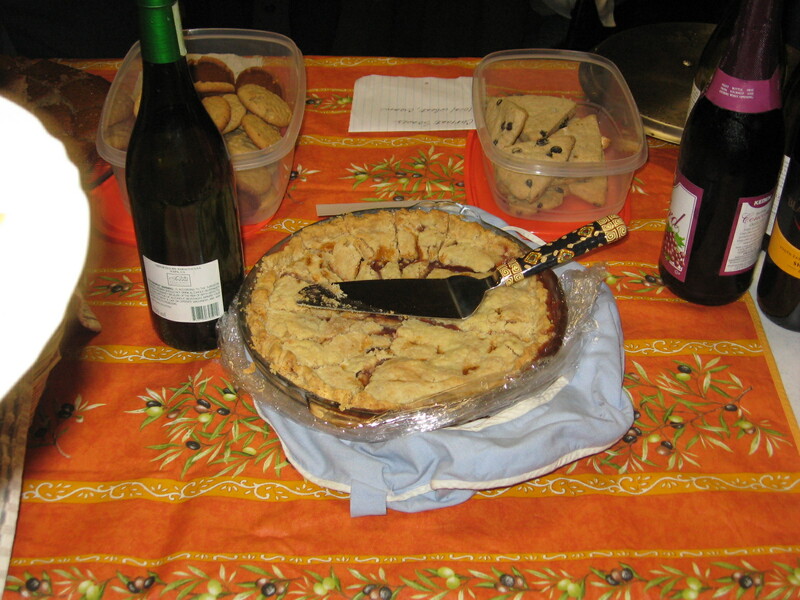 35 people attended and enjoyed a convivial potluck meal followed by the meeting. Participants loved the many delicious dishes, from roast pork belly to moussaka, white beans with truffle oil to chicken Marbella, potatoes au gratin to beet salad–too many to count, and requiring several trips back to the groaning board to satisfy curiosity and appetite. 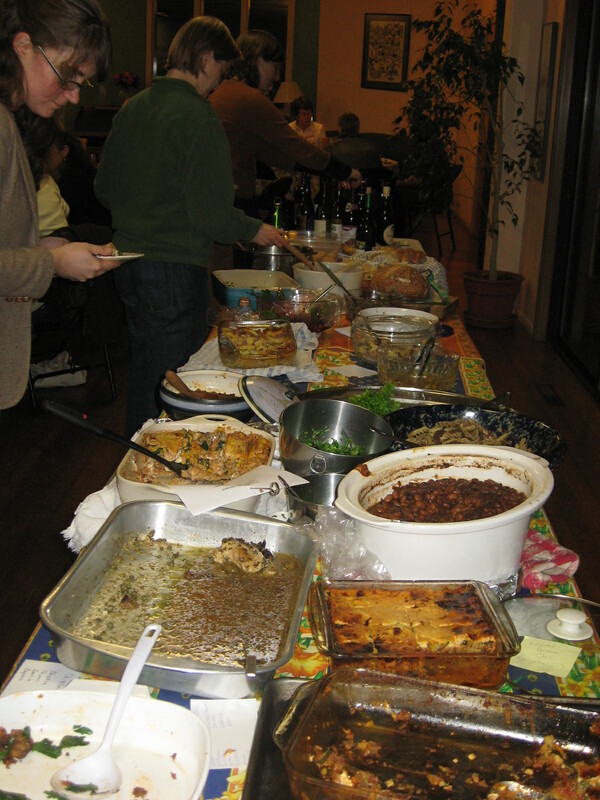 A Slow Food potluck is an event not to be missed! Once participants were replete with food and wine, SFC President Ann Shriver quickly reviewed the events of the past year and presented a summary of financial reports from SFC Treasurer Anne White. Jen Brown from the Corvallis Environmental Center (CEC) gave us an update on the Edible Corvallis Initiative and the variety of projects now ongoing which include the Starker Arts Garden for Education (SAGE), 2 community gardens which involve 100 families, an annual chicken coop tour, a farm-to-school program to encourage local schools to buy local foods, and the tasting tables at elementary schools which have grown from the beginning at Lincoln School to encompass all the district. Jen and Ann Shriver have been meeting to discuss Slow Food and the CEC sponsoring a “one-field meal” type dinner at SAGE both as a fundraiser and as an educational event. JC Mersmann has offered his services as chef. This will be planned in August/September to celebrate the local bounty and take advantage of late summer’s good weather. Rose Marie Nichols-McGee spoke briefly about the possible involvement of SFC with an Ethiopian garden project. This was prompted by the request from Slow Food International to support a garden project in Africa. Rose Marie has been talking with the local Corvallis folks involved in the Sister Cities program with Gondar, Ethiopia. A possible focus would be on a local grain product, teff. This project is still in information-gathering mode. Intaba Liff-Anderson, member of the SFC Leadership group, described our next event called Souper Soup which will be a soup swap scheduled for February 27 at 2 pm, venue to be determined. Any proceeds will be donated to the Stone Soup kitchen. The rest of the meeting was dedicated to a brainstorming session led by SFC Board Member Larry Lev to provide ideas and volunteers for 2011 events. Some of the most promising events include those listed below (with names of parties interested in organizing following in parentheses). 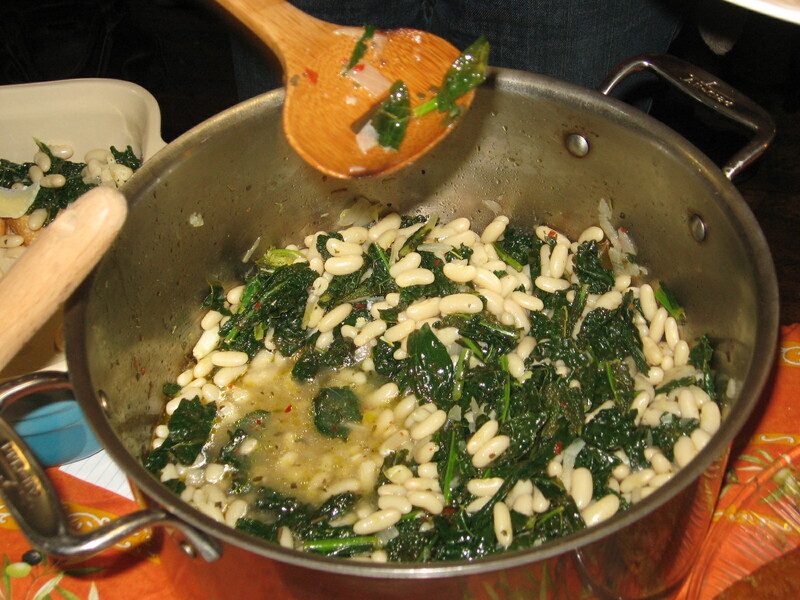 * Cookbook Exchange: gather and re-sell cookbooks and gardening books to raise funds/awareness. Gather cookbooks/gardening books at various events, re-sell them for donations outside Farmers’ Market. The Slow Food Corvallis Board of Directors will meet in February to discuss these events, and develop a tentative calendar for the coming year. 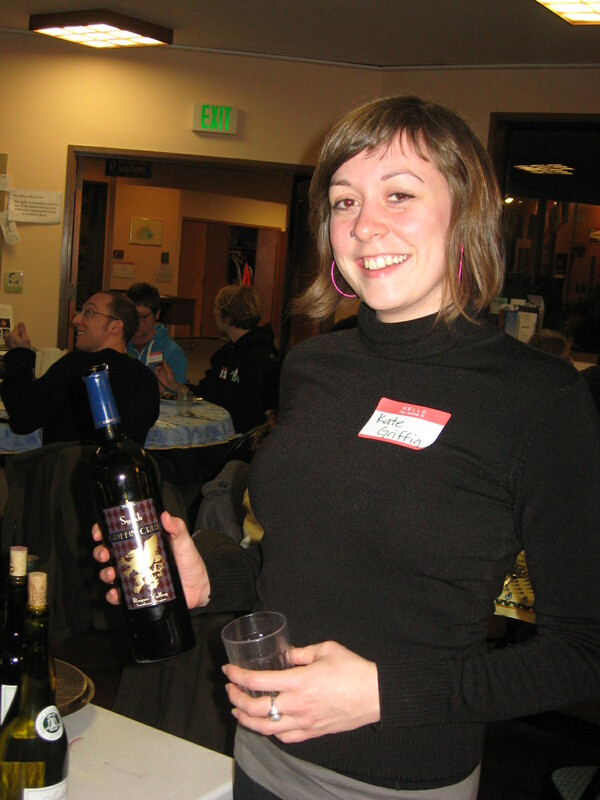 General invitations to help organize the events will be sent out to the Friends of Slow Food Corvallis, several months prior to each event. Individuals interested in working on any of these events are strongly encouraged to contact slowfoodcorvallis@comcast.net. The best way to ensure that your favorite event occurs is to add your energy and initiative to the planning and implementation process!